Are you interested in the history behind Hot Cross Buns? Do you want to learn more about where they come from and get the ultimate Hot Cross Bun recipe? 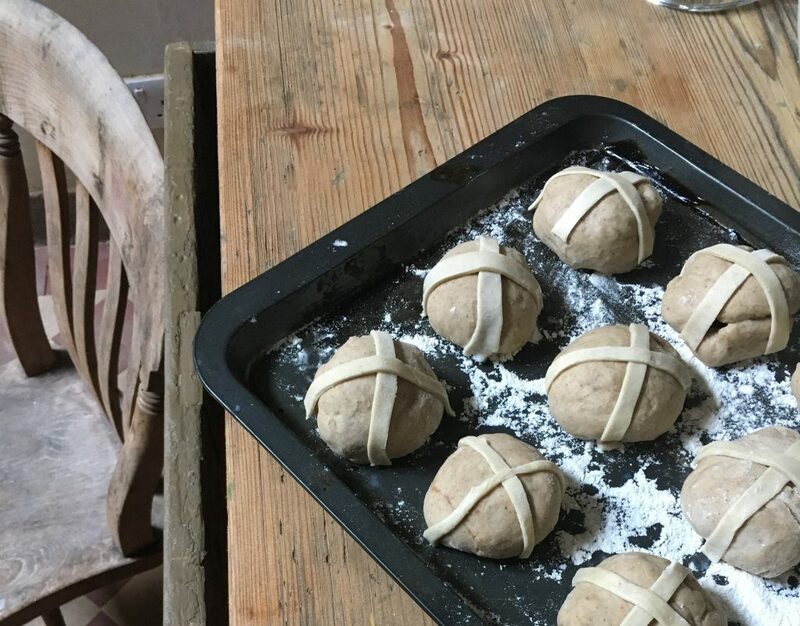 In this blog post I give a quick history of the Hot Cross bun and give you a wonderful historic recipe which uses sourdough to give an authentic taste. This will allow you to produce buns this Easter that not only have a historic backstory but also taste really good. 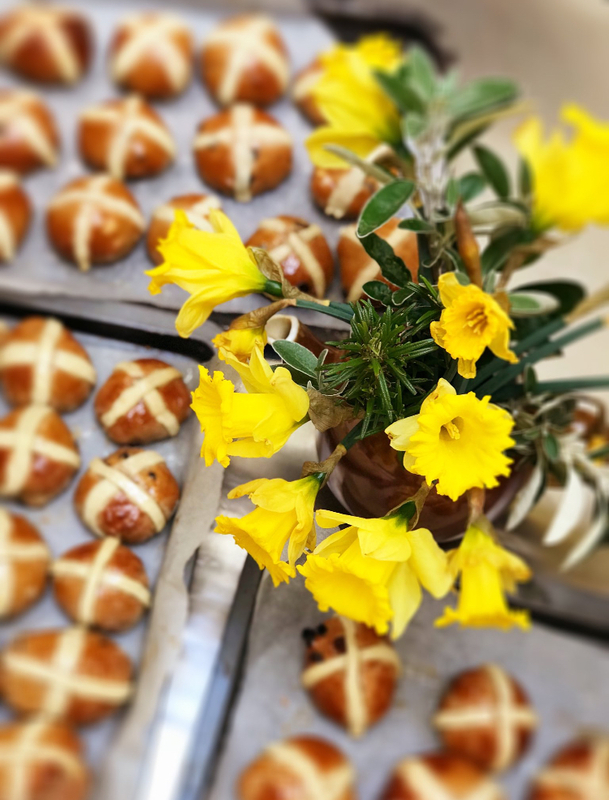 If you’d like to join in a workshop and come to the Town House and make Hot Cross Buns in a historic kitchen follow this link. Originally dried fruit was added to bread dough to honour a goddess. 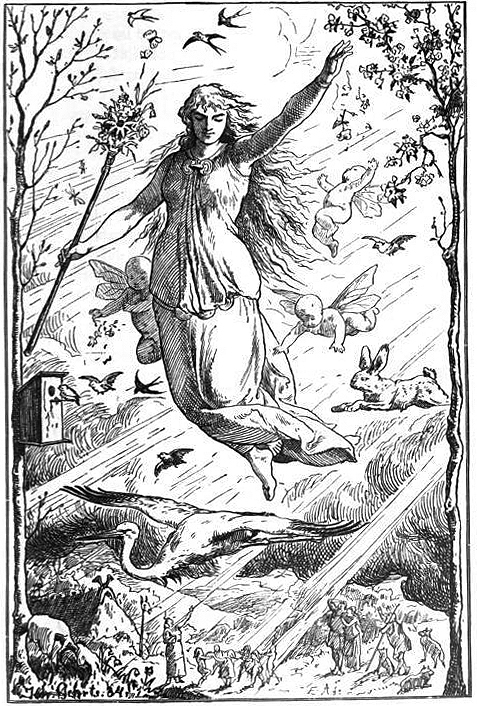 Eastre was the Saxon goddess of spring and of the dawn. To honour her, bread dough was studded with dry fruits and baked into small loaves. “Precious, sensuous foods, [these buns] were bound up with hope for good harvests and abundant summers, and they must have been eagerly awaited, filling the senses with keen anticipation as they were taken hot from the oven or coated in honey”. The cross came as Christianity spread. Monks began to mark their small bread loaves with crosses. This was the earliest form of Hot Cross Buns. The crosses were made all year round, though. The cross was made with hope that the baking would be successful. The cross was to ward off evil spirits that might prevent the bread from rising. The special association of Hot Cross Buns with Good Friday began only after the reformation. The practice of making crosses on bread was abandoned as being popish (or Catholic) in the 1600s. It was only kept on for Good Friday. That was the day in the church’s calendar when the symbol of the cross had the most significance. There is a belief that items baked at Easter have special properties. Hot Cross Buns have been thought to be protective or even curative. They were thought to be capable of preventing fires or protecting against shipwreck. One Hot Cross Bun has been kept in the same Lincolnshire family since it was baked on Good Friday in 1821. There is also a pub in East London which has a collection of Hot Cross Buns hanging from its ceiling. A sailor told his mother, early in the nineteenth century, to save him a Hot Cross Bun for his return. He never came back and his mother set aside a bun for him every year. Her cottage was replaced by the pub, which now continues the tradition. Every year a sailor present the landlord with a new Hot Cross Bun to be added to the collection. In 1793 Hot Cross Buns were so popular in Chelsea, London that “excessively boisterous revelling” happened on the streets. During public holidays Hot Cross Buns, spiced and fruited, would be available to buy. The general public, having no ovens at home to bake their own buns, would look forward to these public holidays. Demand was great, and supply was limited. On Good Friday open spaces were filled with drinking booths, swings and disreputable entertainments. This combination of funfair, pleasure garden and public holiday led to huge crowds. Indeed Bun Houses used to make buns in advance and preserve them before the Good Friday rush. 3 weeks before Good Friday hundreds of tins filled with over 150 baked buns each were stored and kept moist. These were baked again on Good Friday to satisfy demand. 1.Put the flour, yeast, milk, water, sourdough starter, spices, egg, salt, sugar and butter in the bowl of a food mixer. Using the dough hook mix to a sticky dough. Then add the dried fruit and knead on a slow speed until the dough is silky and smooth. (You can do this by hand too. The dough is sticky. Don’t be tempted to add too much extra flour). Cover the dough and leave in a warm place for an hour or until doubled in size. Knock back the risen dough. Divide into even pieces. About 50-60g dough will make a small, neat bun when it is baked. Grease a tin with oil and place the buns onto the prepared tin. Allow a little space between each bun to allow for extra expansion. Loosely cover with a teacloth and allow to rise for half an hour, in a warm place, or until they are doubled in size again. To make the crosses whisk together flour and water in a bowl until smooth. Put this mixture into a piping bag. Pipe a cross on top of each bun. Now bake the buns in the oven for 15-20 minutes. When ready the bun should sound hollow when you hold a bun to your ear and tap its base. Be careful not to burn yourself! Prepare the glaze by heating the milk in a small pan together with the sugar, until the sugar is completely dissolved. Brush the glaze onto the buns as they come out of the oven. This is my favourite part. The buns will smell spicy and they will look glossy and sticky as you brush on the glaze. Let your buns cool on a wire rack slightly before eating and enjoying. I think the buns taste best when served warm. Cold buns can be reheated in a low oven for 5-10 minutes. Sourdough starter gives an extra authentic taste to the Hot Cross Buns. Originally these buns would have been made with yeast derived from the brewing process. You can leave out the yeast and make these buns as you would sourdough bread. Although this will take considerably longer. This recipe combines the taste of sourdough with the speed of commercial dried yeast. To make these hot cross buns vegan replace butter with vegan butter substitutes, egg with apple sauce and milk with almond milk.